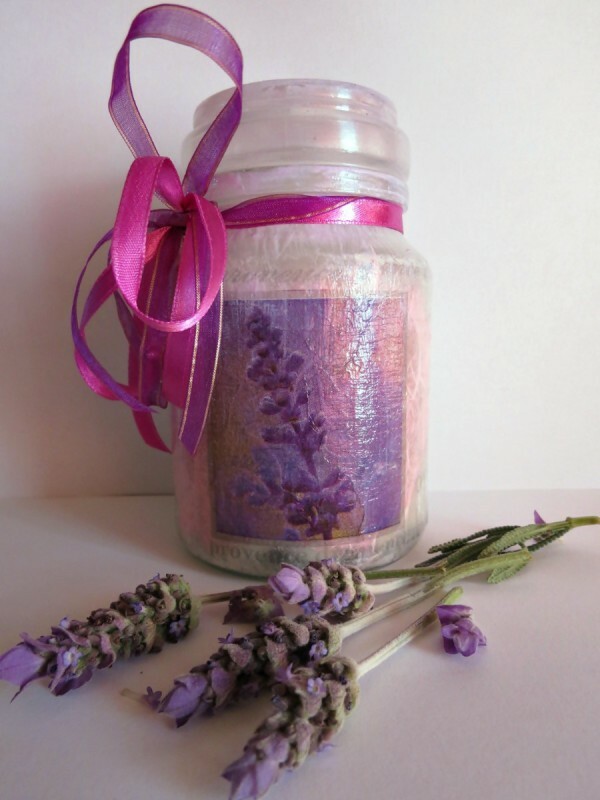 A decorative jar filled with lavender infused sugar is a lovely gift to make or receive. Use the flavored sugar in baking or beverages. The jar can then be refilled or put to other uses. This is a guide making a lavender infused sugar jar. Christmas is just around the corner, the perfect time to start making gifts. Find your inspiration for this kitchen gift in the beautiful French region of Provence. Choose the lush color of purple lavender so often seen in this area, and add a whimsical feel with a touch of pink and white. Use napkins with suitable words and pictures printed on them, and create a kitchen gift for a food-loving friends' Christmas stocking. Fill the jar with lavender infused sugar, and spoil her with sugar that would add a special touch to her next round of baking. Cut strips with the printed words from the napkins and remove the bottom layers from all the napkin strips. Paint a substantial amount of Modge Podge to the jar. Put the first strip of napkin in position on the jar. Paint Modge Podge over the strip of napkin, so that it will stick to the jar. As the napkin can stretch or tear easily, it is best to start painting from the middle of the strip towards the sides, and working in small triangles. Use the hairdryer to dry the strip of napkin. 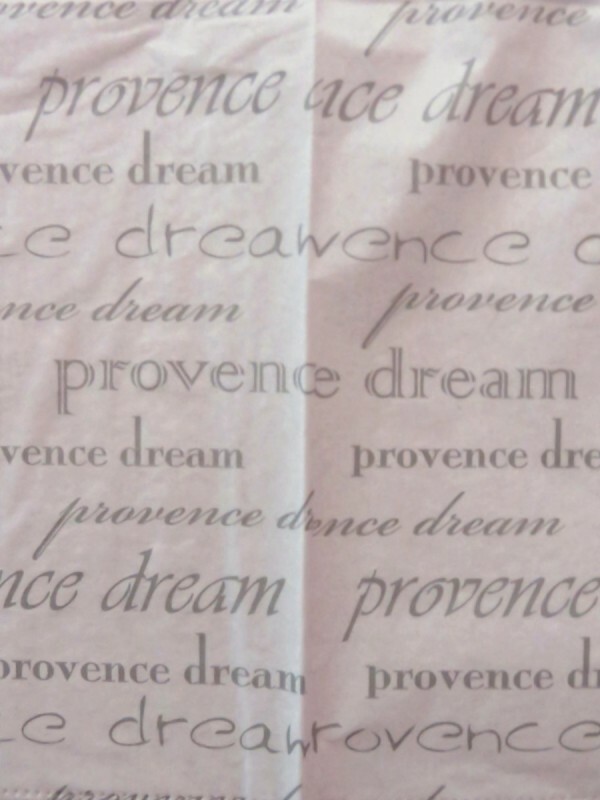 Repeat steps 3-4 with the other strips of napkin, until the jar has been covered with the strips of napkin with the words Provence and Dream. Roughly tear a piece from the handmade pink rice paper. Paint a substantial amount of Modge Podge on the jar where the torn rice paper would be added. Put the rice paper in place and follow the description given in steps 3-4 to affix the rice paper to the jar. Cut out one of the lavender pictures from the napkin and remove the bottom layers from the lavender picture. Put the lavender napkin picture in place and follow the description given in steps 3-4 to affix it to the jar. Paint a thin layer of Modge Podge over the jar. Remember to paint gently over the napkin strips, the rice paper and the lavender picture. The Modge Podge will protect the pictures and give the product a smoother finish. Note: Do not add any Modge Podge to the bottom of the jar. Dry the jar thoroughly with the hairdryer. Repeat steps 11-12 ~ you need to apply at least 3 coats of Modge Podge, but remember that with every layer, the direction in which the Modge Podge is applied, must be changed from horizontal to vertical to horizontal, etc. Remove the spongy foam pad from the ink stamp pad's plastic backing. 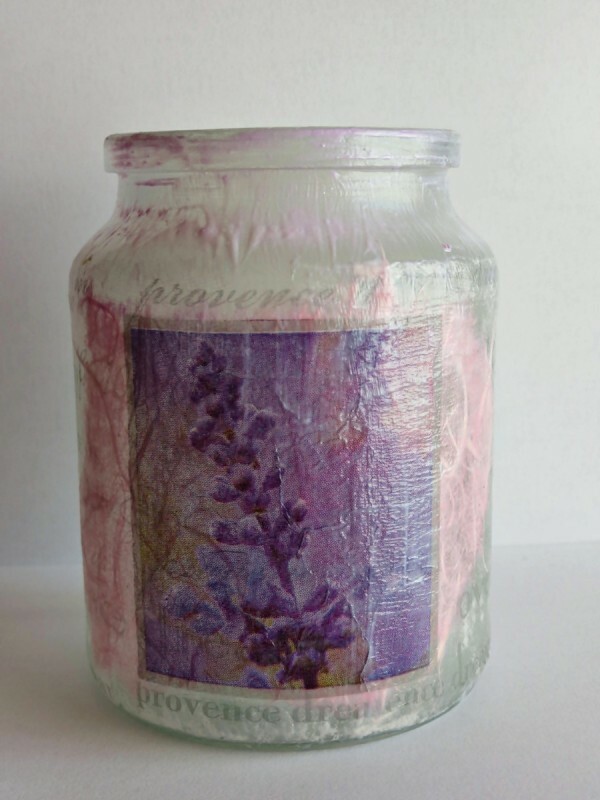 Fold the spongy foam in half and use it to give the top of the jar a wash with the light purple pigment ink. Allow to dry thoroughly. Apply a final coat of Modge Podge and allow to dry thoroughly. While adding this layer of Modge Podge, regularly clean the brush on a piece of newspaper, as some of the ink from the wash will rub off onto the brush. Dry the jar thoroughly with the hairdryer. 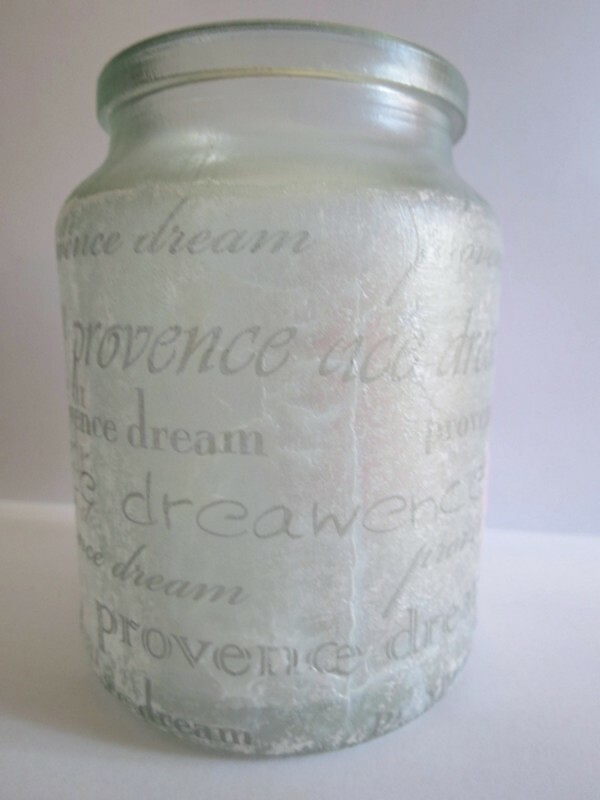 Add a layer of water-based varnish to the jar and use the hairdryer to dry the jar thoroughly. Paint one coat of Modge Podge over the lid, but do not paint over the rubber sealing. Dry thoroughly with the hairdryer. Paint one coat of water-based varnish over the lid and dry thoroughly. 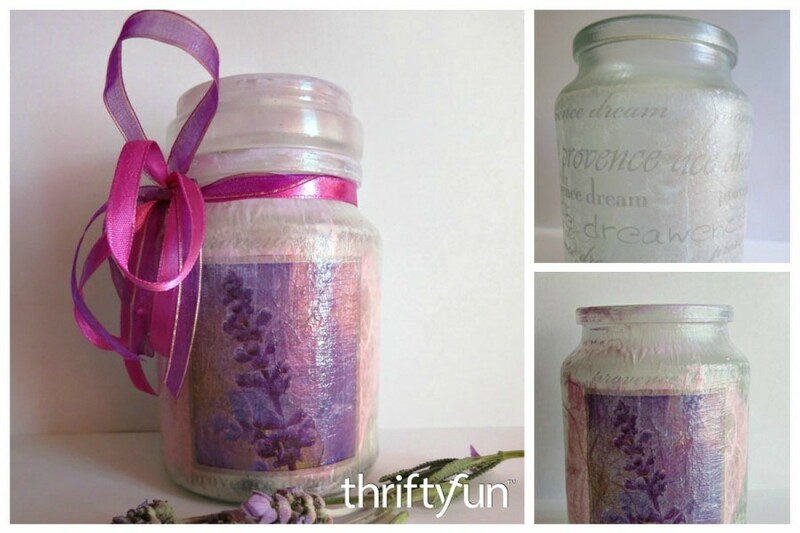 Fill the jar with the lavender infused sugar. Tie the ribbons around the jar's neck and make a bow. Where's the recipe for lavender infused sugar? The article was not about making the sugar itself, but about decorating the bottle. There are countless recipes on the internet for making lavender infused sugar. I like the one at www.organicgardening.com/.../infused-sugars, as the ingredients are all organic.